Now is the time to start preparing for a fun and safe summer. On average there are 10 unintentional drownings per day in the United States – one in five people who die from drowning are children 14 and younger. You can help prevent drowning from happening in Kansas. Don Hattan Dealerships has teamed up with the Wichita Swim Club to help raise money for their scholarship program. A portion of the money raised will go directly to teaching in-need children how to swim. 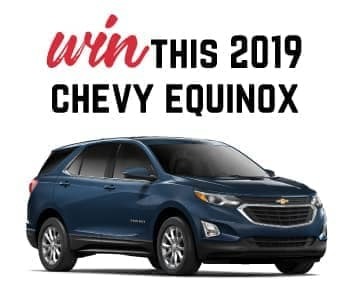 Right now, you can purchase a $100 raffle ticket and be entered to win a 2019 Chevrolet Equinox, plus help save a child’s life. You can increase your odds of winning by purchasing multiple tickets. The drawing will be held on February 23 at Wichita Swim Club. Entries do not have to be present to win. Click on the link below for full details and rules. Thank you for supporting WICHITA SWIM CLUB! Your purchase of one or more Wichita Swim Club (WSC) raffle ticket(s) signifies your agreement to the following Terms & Conditions. In the event of any dispute, a reasonable interpretation or determination by WSC as to the application of these Terms & Conditions is final and binding. All WSC raffles are void where prohibited by law. To be eligible to purchase a ticket, you must be at least 18 years old and a living resident of the United States. The following persons, and their employees and “immediate family members”, are not eligible to purchase a ticket: Officers, directors, and employees of WSC, Don Hattan Chevrolet or KWCH Television. “Immediate family members” includes the spouse, parents, grandparents, great-grandparents, brothers, sisters, children, grandchildren, and great-grandchildren of the employee and his/her spouse. This definition also includes individuals for whom an employee is the current legal guardian or individuals who are not legally related to but who reside with an employee, including “step” and adoptive relationships. The determinations of WSC are final and binding with respect to any matter arising out of the interpretation or application of these terms and conditions. Eligible persons may purchase tickets online or in person through the end of the raffle period. Ticket purchases submitted by mail must be received, with payment, at the WSC offices at 8323 E Douglas Ave, Wichita, KS 67207 at least 72 hours prior to the end of the raffle period or the purchaser will be declared ineligible. A ticket purchased by an ineligible person is void, and cannot be a winning ticket. No refunds will be made to ineligible purchasers. A ticket issued in exchange for a check returned for “insufficient funds,” or for a credit card charge that was “declined,” or reported as “invalid” or “stolen” is void, and cannot be a winning ticket. A ticket represents the opportunity to accept stated prize(s) under these terms and conditions. All sales of tickets are final, and no refunds will be paid. Tickets, prizes, receipts, and any winner’s rights are not transferable. The IRS has ruled that a payment for a raffle ticket is a tax-deductible charitable contribution only to the extent the amount of the payment exceeds the price of the ticket. The winning ticket for the grand prize will be selected by a random drawing. All tickets have an equal chance to win. Ticket purchasers need not be present to win. There will be a maximum of 1,500 tickets sold at $100 per ticket. The grand prize will be awarded to a winner provided that more than 501 tickets are sold. If WSC does not sell more than 501 tickets, then an alternative cash prize will be awarded to the winner in lieu of the stated grand prize. The value of the alternative cash prize will be half the value of the total number of tickets sold. The grand prize will be a 2019 Chevrolet Equinox LS with a retail of $27,965. If the minimum ticket sales threshold is met (see above), the grand prize winner has no cash option. The winner is not entitled to any settlement, award, or refund of any difference in retail value of final selection and stated grand prize value limit. If the grand prize winning ticket has more than one name on it, the prize will be awarded to the eligible individual whose name appears first on the ticket. That individual is solely responsible for allocating the value of the prize among the purchasers. WSC will provide official notification to the winner via the phone, email, and/or mailing address provided by the winner at the time of ticket purchase/entry. Notification by WSC and presentation of the winner of the Winner Affidavit is the only official winner announcement and notification process that will entitle the winner to the state grand prize. The grand prize winner will be provided a Winner Affidavit (“WA”) and the grand prize winner must accept the prize, “as is,” by signing the WA and returning it to WSC within seven (7) days after the date the WA was received. If the winner fails to accept the prize, the prize is forfeited and no substitute or alternative prize will be provided. A forfeited prize will be awarded to the next winner that was selected in the drawings. Acceptance of a prize constitutes permission for WSC to use the winner’s name, picture, video image, and relevant quotes to promote the WSC raffle, and agreement by the winner that the prize will not be used for fundraising for another charity. WSC may, at its sole option, substitute a prize of equal or greater value if the stated prize is not reasonably available. The winner of the grand prize shall have no rights in or to the prize itself until he/she has timely executed the WA and returned it to WSC and until delivery of the prize to the winner has been completed. Until that time, as between WSC and the winner, each prize remains the sole property of WSC. The winner accepting the grand prize/vehicle or the substituted prize will take ownership subject to all applicable federal, state, and local restrictions. The value of each prize is includible in the winner’s gross income, and is subject to reporting by WSC to the Internal Revenue Service. Each winner is solely responsible for payment of all federal, state, and/or local income, sales, or use taxes due to his or her acceptance of any prize won through the raffle. With respect to any prize whose value is more than $5,000, the Internal Revenue Service requires WSC to withhold federal income tax at the rate of 24%, and the winner must pay the amount of tax to be withheld to WSC as a condition of transfer of ownership of the prize. Payment should be submitted when the WA is returned. WSC will issue the winner an IRS Form W-2G and remit payment received by the winner to the IRS. The winner is responsible for payment of applicable taxes, titling, and licensing fees prior to receiving the vehicle. The sales tax amount on the prize shall be paid by winner at the time of prize acceptance. These estimated amounts represent only that which WSC is required to submit to the IRS. Other applicable taxes, titling, and licensing fees will apply and are the responsibility of the winner. Winners should consult a tax professional. Each winner accepts the prize “as is,” and without recourse to WSC, Don Hattan Chevrolet or KWCH Television with respect to any defect, injury, damage, or other problem that may arise or become apparent with respect to the prize. Because WSC has no right to control, nor exercises any control, over the personnel of any seller, or manufacturer of any prize, or any part of any prize, WSC assumes no responsibility for any financial loss, personal injury, property damage, or other loss, accident, delay, inconvenience, or irregularity that a winner may experience by reason of (1) performance or nonperformance by any supplier; (2) wrongful, careless, negligent, or unauthorized acts or omissions by any supplier or its employees, or by any other party not under the control of WSC; (3) acts of God and acts or omissions of third parties; (4) mechanical or construction failures; or any other event or condition beyond WSC’s control. Each winner hereby releases and holds WSC, Don Hattan Chevrolet and KWCH Television harmless with respect to any claim based on any such occurrence. WSC, Don Hattan Chevrolet or KWCH Television shall in no event be liable for special or consequential damages arising from the use or ownership of any prize.